Battery Point overlooks the narrowest and shallowest part of Chilkoot Inlet. Stand on the beach and look for the telltale blows or flukes of humpback whales. Scan the waters for the reflection off the head of a harbor seal or Steller sea lion. Closer to shore, look for loons, surf scoters, pelagic cormorants and marbled murrelets as they dive in search of a meal. Battery Point is at the end of a flat, primitive trail that leads through the rain forest for a little over a mile before reaching the water. It is possible, though not common, to encounter bears and moose on the trail, so stay alert while hiking. Fish pool in the relatively still waters off of Battery Point, attracting a variety of marine mammals. Walk along the beach for different views of the water to maximize your wildlife viewing chances. While the Battery Point trail is an easy one-mile hike, be advised that a combined walk from town and trail hike is an over five-mile round trip. 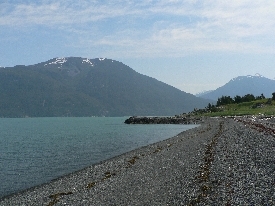 The Battery Point trailhead is located about a mile and a half south of town at the end of Beach Road.